After you are familiar with OFCS (Offline Charging System) and OCS (Online Charging System) time has come to be more up to date with interfaces that are being used to exchange signaling data. At first I will talk about Gx interface which is responsible for Offline Charging, but not only. The Gx reference point is located between the Policy Control and Charging Rules Function (PCRF) and the Policy and Charging Enforcement Function (PCEF). The Gx reference point is used for provisioning and removal of Policy and Charging Control (PCC) rules from the PCRF to the PCEF and the transmission of traffic plane events from the PCEF to the PCRF. The Gx reference point can be used for charging control, policy control or both by applying AVPs relevant to the application. As you probably know, it's always good to start from big picture. Here we go. So at first, few information about..
Oh, and please note that by IP CAN bearer I mean: IP transmission path of defined capacity, delay and bit error rate, etc. For more details please see 3GPP TS 21.905. An IP-CAN session incorporates one or more IP-CAN bearers. Support for multiple IP-CAN bearers per IP-CAN session is IP-CAN specific. An IP-CAN session exists as long as the related UE IPv4 address and/or IPv6 prefix are assigned and announced to the IP network. It will be needed for text presented below. The PCEF (Policy and Charging Enforcement Function) shall select a PCC rule for each received packet by evaluating received packets against service data flow filters of PCC rules in the order of the precedence of the PCC rules. When a packet matches a service data flow filter, the packet matching process for that packet is completed, and PCC rule for that filter shall be applied. Dynamic PCC rules. Are dynamically provisioned by the PCRF to the PCEF via the Gx interface. These PCC rules may be either predefined or dynamically generated in the PCRF. Dynamic PCC rules can be Installed, Modified and Removed any time. Predefined PCC rules. Preconfigured in the PCEF. Predefined PCC rules can be Activated or Deactivated by the PCRF at any time. Predefined PCC rules within the PCEF may be grouped allowing the PCRF to dynamically activate set of PCC rules over the Gx interface. charging key (i.e. rating group) - define whether online and offline charging interfaces are used, what is to be metered in offline, on what level the PCEF shall report the usage related to the rule, etc. The PCRF (Policy Control and Charging Rules Function) is a functional element that encompasses policy control decision and flow based charging control functionalities. The PCRF provides network control regarding the service data flow detection, gating, QoS and flow based charging (except credit management) towards the PCEF. The PCRF reveives session and media related information from the Application Function (AF) and informs AF of traffic plane events. The PCRF Shall provision PCC rules to the PCEF via the Gx interface. If the information from the PCEF (Policy and Charging Enforcement Function) contains traffic mapping information not matching any service data flow filter known to the PCRF, and PCRF allows the UE to request enhanced QoS fo services not known to the PCRF. The PCRF shall add this traffic mapping information as service data flow filters to the corresponding authorized PCC rule. The PCRF may wildcard missing filter parameters. PCRF shall report events to the AF via Rx interface. The PCRF shall inform the PCEF through the use of PCC rules on the treatment of each service data flow that is under PCC control, in accordance with the PCRF policy decisions. PCRF shall be able to select the bearer control mode that will apply for the IP CAN session and provide it to the PCEF via the Gx interface. Upon subscription to loss of AF (Application Function) signalling bearer notifications by the AF, the PCRF shall request the PCEF to notify the PCRF of the los of resources associated to the PCC rules corresponding with AF Signaling IP Flows, it this has not been requestet previously. The PCEF (Policy and Charging Enforcement Function) is the functional element that encompasses policy enforcement and follow based charging functionalities. This functional entity is located at the Gateway (PGW). It provides control over the user plane traffic handling at the Gateway and its QoS, and provides service data dlow detection and counting as well as online and offline charging interactions. For a service data flow that is under policy control the PCEF shall allow the service data flow to pass through the Gateway if and only if the corresponding gate is open. For a service data flow that is under charging control the PCEF shall allow the service data flow to pass through the Gateway if and only if there is a corresponding a active PCC rule and, for online charging, the OCS has authorized the applicable credit with that Charging Key (Rule Base). The PCEF may let a service data flow pass through the Gateway during the course of the credit re-authorization procedure. If requested by the PCRF, the PCEF shall report to the PCRF when the status of the related service data flow changes. This procedure can be used to monitor an IP CAN bearer dedicated tfor AF signalling traffic. For detailed information about what fields are set, and so on please see the TS 29.212 paragraph 4.5.1. 2. The PCRF judges whether to update the PCC rules (namely, old PCC rules) according to the event-trigger, and returns a Credit Control Answer (CCA-I) message to the PCEF. If the PCC rules need update, the retuned CCA-U (CCR-U and CCA-U stand Credit Control Request/Answer Update_Request) message carries the updated PCC rules (namely, new PCC rules), and the PCRF stores both the old PCC rules and the new PCC rules. 3. After receiving the CCA message, the PCEF executes the PCC rules. If the returned CCA message carries the new PCC rules, the PCEF executes the new PCC rules; if the returned CCA message carries no new PCC rules, the PCEF executes the old PCC rules. When the PCEF executes the PCC rules unsuccessfully, the PCEF sends a new CCR message. PUSH procedure (Unsolicited provisioning): The PCRF may decide to provision PCC rules without obtaining a request from the PCEF, e.g. in response to information provided to the PCRF via the Rx interface, or in response to an internal trigger within the PCRF. To provision PCC rules without a request from the PCEF, the PCRF shall include these PCC rules in an RAR (Re-Auth-Request) message. No CCR/CCA (Credit Control Request/Credit Control Answer) messages are triggered by this RA-Request. 1. 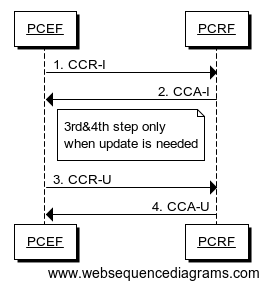 When an event-trigger event occurs, the PCRF updates the PCC rules, and sends a Re-Auth Request (RAR) message to the PCEF. The RAR message carries new PCC rules, and the PCRF does not store the old PCC rules. 2. The PCEF executes the new PCC rules delivered through the RAR message. After completion of the execution, the PCEF sends a Re-Auth Answer (RAA) message to the PCRF. To activate or deactivate a PCC rule that is predefined at the PCEF, the PCRF shall provision a reference to this PCC rule within a Charging-Rule-Name AVP and indicate the required action by choosing either the Charging-Rule-Install AVP or the Charging-Rule-Remove AVP. To install or modify a PCRF-provisioned PCC rule, the PCRF shall provision a corresponding Charging-Rule-Definition AVP within a Charging-Rule-Install AVP. To remove a PCC rule which has previously been provisioned by the PCRF, the PCRF shall provision the name of this PCC rule as value of a Charging-Rule-Name AVP within a Charging-Rule-Remove AVP. 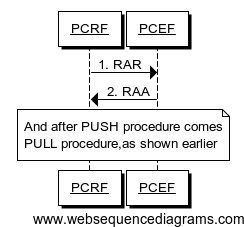 If, for certain accesses, the PCRF performs the bearer binding, the PCRF may move previously installed or activated PCC rules from one IP CAN bearer to another IP CAN bearer. See annex A in TS 29.212 for further details. Hi, what is the difference between a Gx session and an IP-CAN session? thank you! Very interesting and very clear. In the overview scheme, to complete, you could add Sy interface between OCS and PCRF. How the modification of a PCC rule works, say you want to add a new TFT to an already installed PCC Rule, what should be done over Gx? Should the PCRF re-provisioned the complete list of TFTs for example? Nice small write up ! what exactly PCC rule is? is it like restricting certain URL??? Anonymous, restrict certain URL by reading http host header it is too easy. PCC rules it is more flexible and convinient solution. Using PCC rules you can apply some actions to specified "service" or to all subscriber`s traffic. What is service? it depends on you eqipment and vendors. e.g. On PCEF each service has number. Pcrf knows this numbers and can use them. You can manually assign Service-Identifier 7777 is smtp protocol, then PCC rule given below can enable blocking all smtp for a subscriber on PCEF. Of course you can define url and block by host header, but it it not good practice. DPI engine is the key. DPI engin classify traffic and makes correlation btw Service-Identifier and type of traffic. So you can prohibit or decrease speed for facebook.com, fb.com and other aliases. Thanks Nikita for your time and effort to go through comments and post the above here. what should PCEF reply if PCRF sending Charging-rule-remove to PCEF. Hi Bart, your post is really helpful to our engineering job. I would bother you to dig in 3gpp and make the complete list of function and feature of PCRF, PCEF. I am confused by suppliers providing the list of function whether some claim as basic function/feature while some claim advance. Thank you very much for detailed explanation of Gx interface. I would like to get more knowledge about interface between PCRF and OCS. Is there any interface between these two components? Could please explain above mechanism with nice and simplistic example like Subscriber having 1GB Data Plan for 1MBPS for 30days. What will happen next when data event comes from netwrk to PCEF? Thanks for giving the details of Gx interface. I want understand what is Rating-Group? How many Rating-Group possible? session can have multiple Rating-Groups ?